For retreats and such, I wanted to organize my lesser-used little tools and notions that I didn’t want mixed in with my constant-use tools. 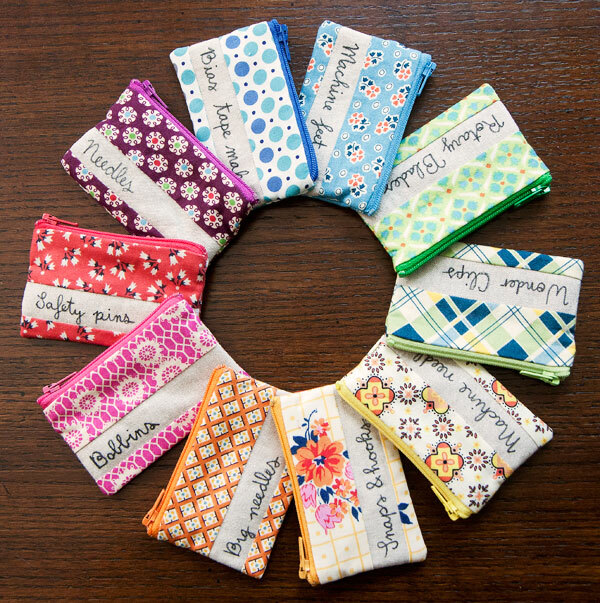 Enter these tiny labeled notions pouches! 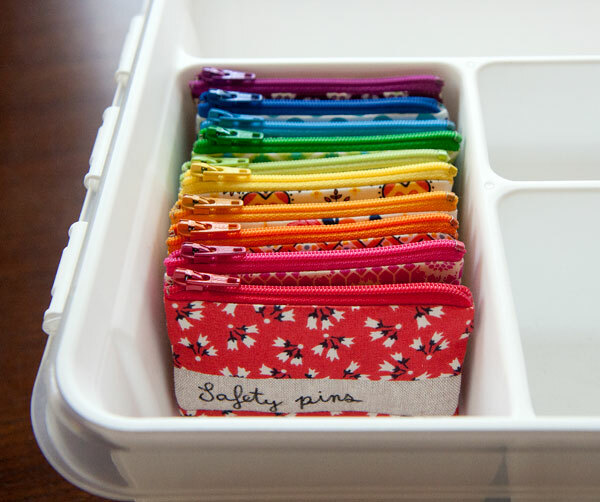 When I first started making zipper pouches years ago I bought a set of 4″ rainbow zippers, and they had been sitting for a long time with me wondering what on earth I was going to do with them. 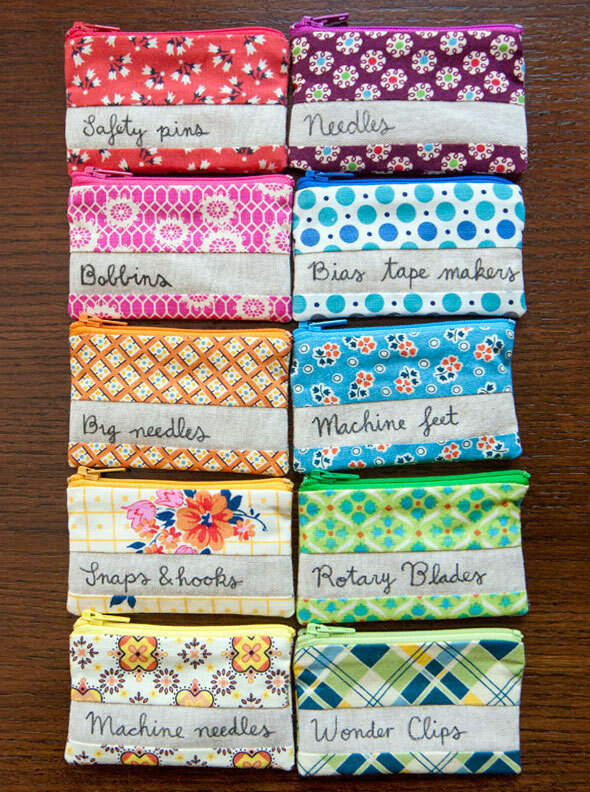 (I now buy 14″ zippers instead as they are about the same price and I just cut them off to the length I need). With this set I managed to use them all up! I added a couple more colors (red and dark blue) to fill out the rainbow. They fit perfectly into my new retreat tool case (from the Container Store, the top piece the is Orthex Smart Store Classic, insert for 12/13). 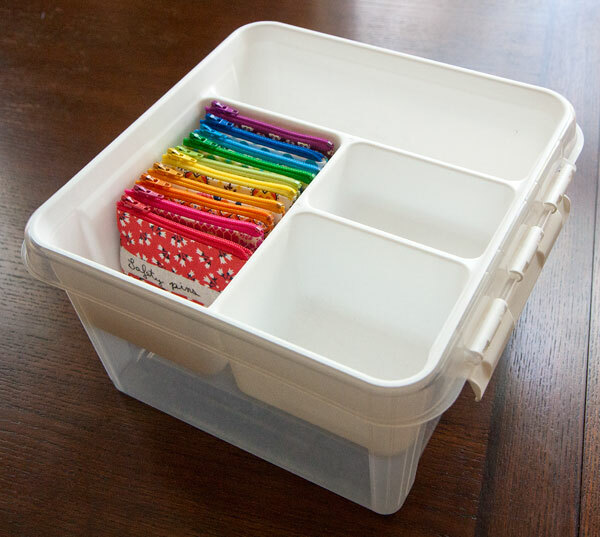 This case holds spools of thread and some bigger items, like extra zippers and basting glue. Basically everything that doesn’t fit into my Sew together bag! 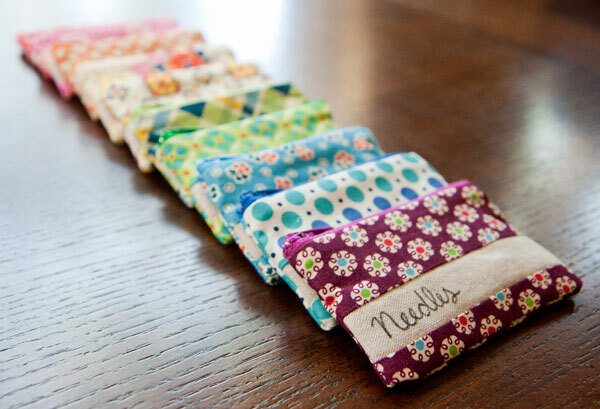 I started these little pouches well over a year ago, but they stalled for a long time because I was going to embroider the labels onto the linen strips. When I finally tried embroidering them they looked terrible! So I just wrote the labels with a Pigma Micron pen. Super easy and looks great, so that was a win! For fabrics I used all Denyse Schmidt prints as they play so nicely together, and for the label strip I used Essex Linen in Flax. 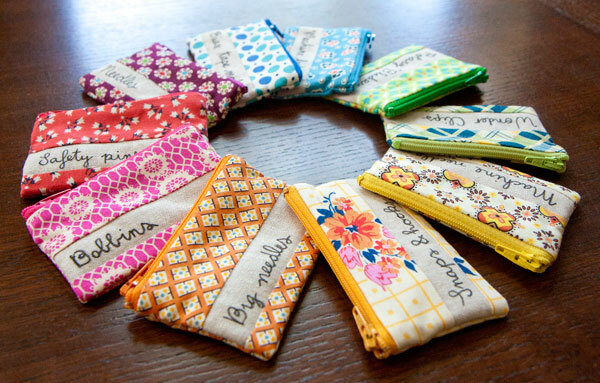 I really love these little pouches! I was having so much fun when they were finished just arranging them in different ways and admiring the rainbow. Ha!